If you’re not familiar with Google My Business, it’s simply their business listing, their business directory, that is integrated with the Google search engine. When you search for a lawn care service provider in your market, plumber, lawn care provider, whatever the case may be; you’re going to see a listing of businesses that have reviews and you can leave reviews on. It displays their phone number, what services they offer, short description, some photos, all of that good stuff. Google My Business is really one of the cheapest things that you can do to market your business. If you do it right, get a really incredible return on your investment which would be time. It’s free to set up a listing. You can do it yourself. There’s a lot of key things that you need to know to do it correctly, to get it to rank properly. We’re not going to cover those things today. It is something that every lawn care business owner should do. Big changes, number one all of these changes with Google My Business … A lot of them are occurring because Google is winding down its social network, Google+. Google+ was created to compete with Facebook. Unfortunately even though it was a great product, it never really caught on so they’re winding down that product. They are unintegrating Google My Business with it. Number one, they’re separating Google+ from Google My Business pages. Previously, you would setup a Google+ business page on Google+ the social network. That would appear very much like you see a business on Facebook. A Facebook business page and a Google+ business page were very similar, a lot of the same functionality, descriptions, photos, the ability to post, essentially leave short blog posts and stuff on there. Also, customers can come to that page and actually review it as well. They’ve eliminated that link between Google+ and Google My Business. One of the good things that they’ve done is that also when a client wants to come and review you they no longer have to set up an annoying Google+ personal profile. Basically Google used to force people who wanted to leave you a review to go and actually set up a page on their social network. It would be like if you wanted to leave a review on a business on another site, you would have to go through a whole process to set up a profile that tells people about you, upload a photo, all that nonsense. You don’t have to do that anymore. Now, you just have to have a Gmail address to log in so they can verify your account, that you’re a real person. Then you can leave a review on that business account. The other big thing that they’re doing is that they are actively unverifying and deleting accounts that they deem as inactive or incorrect. If you set up a Google My Business page or a Google local listing years ago and haven’t logged back in, haven’t touched it, haven’t responded to any reviews, haven’t gotten any reviews, haven’t uploaded any photos, just haven’t had any activity on your page whatsoever; then there’s a good chance that Google sent you a notification that your page has been unverified or it’s going to be deleted. Google is simply doing this to increase the quality of their listings. Google My Business listings are integrated on the phone when you do a search within Google. On Android devices when you’re looking for a business, it wants this information to be correct. In order to do that, they need to really clean up some of the business listings that they’ve had in the past that have been incorrect or were set up years ago and those businesses have since gone out of business. You do need to log in to your page every six months. You should be replying to every review that you get as a lawn care business owner. If you’re doing that then you have no reason to worry about your account ever becoming unverified or being deleted ultimately. The other big change and this is the biggest one that I really want to spend some time on is that Google has changed the look of it. When you do a search for let’s say lawn care service in Tulsa, Oklahoma or plumber in New York City or any service in a specific city name, it’s no longer showing you a list of five or seven businesses with the phone number and the reviews and the link to the website and all that stuff. It’s now only showing you three businesses. It just got a lot, a lot more competitive to be on this front page of Google, which is where you make your bucks. Which is where you’ll make a lot of money in a good market because you’re showing up there on that first page of Google. It just got a lot more competitive. Now it’s only showing three businesses on that first page, that first search results page. It used to show five to seven. That means that you really need to step up your effort. I’ll go into exactly what you need to do in a moment. If you click on one of the three business listings that it shows on the first page of Google now, it’s going to take you to Google Maps. It’s going to show you a list of twenty competitors on Google Maps as well, also not very good. Again, we want to be in those top three on that first page of Google. That’s where we make the majority of our money and get the most leads if we can be there, so very important that we do that. The number one thing that you can do to be in that listing of three businesses in your service area is get real five-star reviews for your business, super, super important that you do it. I’ve done quite a few videos on this topic. It’s sad to me to see so many business owners completely disregard it because this is easy money. If you can get in that area of the three listings, and you can if you get reviews, then it’s going to make you money without question. In fact, it’s something that’s so important that we teach two sessions on it in my Academy coaching program. They’re both very in-depth. They give you step-by-step instruction on exactly how to set up and optimize your Google My Business page and on exactly how to get a wealth of five-star reviews. This is what’s going to take you over the top. This is what’s going to get you into those top three listings on that first page of Google. We have two sessions on that in the Academy. They’re both very in-depth. They’re both a couple hours long; tell you exactly what you need to do, how to respond to negative reviews, how to get positive reviews, and step-by-step instructions that you can teach your team to do it for you. If that’s something that you’re interested in, I invite you to visit and check out our coaching program. It is something that if you simply implement one of these strategies, that will pay for your entire investment for years to come within Academy. I can not stress that enough. We teach these step-by-step, exactly how to do this, exactly how to get the top placement with your Google My Business page, exactly how to get tons of real five-star reviews. It will pay for itself. If that interests you, I invite you to check out our website. Have a great day. 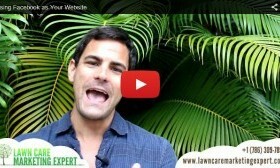 ‹ Should You Use an Instant Lawn Quote System on Your Lawn Care Website?